Edward Park Duplex was elected mayor of Wheatland, California in 1888 to become one of the first African American mayors in the United States and the first in the American West. Born on May 13, 1831 in New Haven, Connecticut to Prince Jr. and Adaline Duplex, his father passed away in 1832 leaving Adaline, a dressmaker, to support the three Duplex children. Edward and his brother learned the barber trade in New Haven but moved to California in 1854 during the Gold Rush. Their mother followed them in 1860. Edward Duplex settled in Marysville, California where he married Sophie Elizabeth (maiden name). The couple had several children. Soon after his arrival on the West Coast, Duplex became involved in local politics and became over time a prominent business and civic leader in Northern California. In 1855, Duplex represented Yuba County at the first California Colored Citizens State Convention in Sacramento. The following year, he served as a member of the convention’s Executive Committee. He was also active at the Mt. Olivet Baptist Church in Marysville. After living 20 years in Marysville, Duplex and his family moved to Wheatland, California, a small town near Sacramento, in 1875. The family soon established a successful hair care business in Wheatland called Duplex’s Hairdressing and Shaving Saloon located at 415 Main Street near the Central Hotel in the central business district. The Saloon not only offered the community hair care service and products, it also quickly became a center of political and social information. Leaders discussed civic matters while receiving hair care services. On April 11, 1888, the Wheatland Board of Trustees elected Duplex Mayor of Wheatland. His election marked the first time a predominantly white city elected an African American as mayor. On January 5, 1900, Edward P. Duplex died in Sacramento at the age of 69 after 45 years in California. 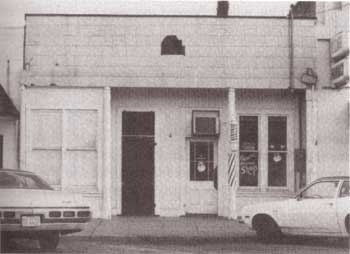 Duplex’s original barbershop, the Hairdressing and Shaving Saloon, still stands in Wheatland today. The building’s exterior has remained intact as it was in 1875.